It's been a busy work week, folks. Also, I lost my wallet, and that needed taking care of, so pardon me for the week's shorter posts. This is going to be me reacting to a couple of comics news. 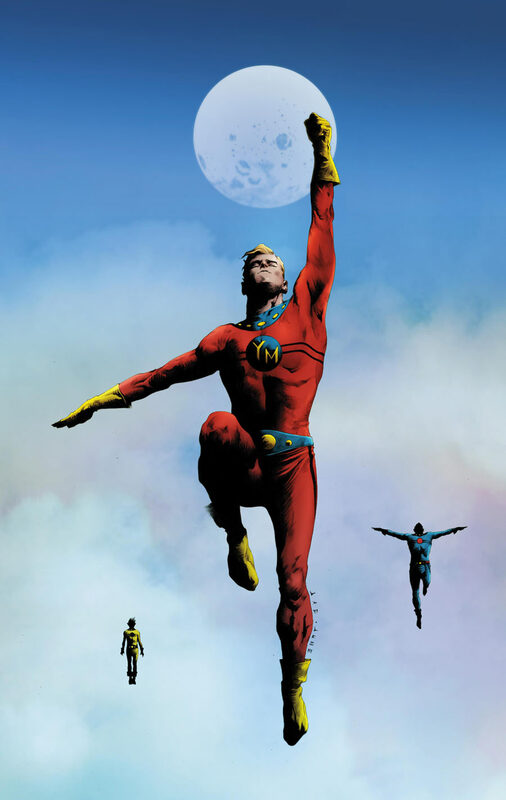 Comic Book Resources has a pin-up done by Jae Lee of the Marvelman family. Young Marvelman takes center stage. I find this misleading. The reason I find this misleading is because this is a pin-up that went inside the Marvelman Classic Primer, out this past Wednesday. The primer reprints the original Marvelman stories from the UK in the 1950s. I don't know what the hold-up is, but it's pretty obvious that Marvelman would not have been historically important if Alan Moore didn't revive the property in the 80s, gave it one of the first-ever "grim-n'-gritty" treatments, brought it to the States, turned it into Miracleman after some legal disputes with Marvel, and made history. History Moore probably regrets making, but history nonetheless. In everyday life, the British comic book character Marvelman, a big, strapping superhero capable of fulfilling all the power fantasies of his adolescent readers, was a young boy just like the readers themselves. He made the transformation by merely saying a special word. He had a couple of subordinate characters, also kids in normal life, who used the same method to transform into lesser superheroes. And if all that sounds a lot like the American comic book character Captain Marvel, there's a good reason — Marvelman was designed to be just like Captain Marvel, because his purpose was to replace that hero, both in the publisher's line-up and in the hearts of fans. This was necessary because the British publisher, L. Miller & Sons, was reprinting Cap's adventures, as well as those of Captain Marvel Jr. and Mary Marvel, when Fawcett Publications decided to throw in the towel on the long-running lawsuit by which DC Comics attempted to quash Cap as a Superman imitator. Sales were down throughout the U.S. comic book market, and superheroes, whose heyday had been the early days of World War II, were especially hard hit. It was a good time to get out of the comics business, Fawcett's management decided, so agreeing never again to publish Cap and his supporting characters seemed a small price to pay for getting rid of an ongoing headache. This presented a problem for Miller, where Cap etc. were still big sellers — in fact, the biggest the company had. The solution was obvious: clone them. Miller hired cartoonist Mick Anglo for the task. At the end of 1953, as the Fawcett titles were dropping off, their Miller counterparts ran announcements that Cap, Junior and Mary had decided to go back to living as normal kids, and would be giving their powers back to old Shazam, the wizard. As of the January 27, 1954 issues, Marvelman and Young Marvelman replaced Cap and Junior, respectively, even to the point of continuing the numbering of the old series and transferring subscriptions to the new ones. Kid Marvelman, tho not exactly analogous to Mary, was added in 1956. Anyway, back to the reason I find the whole image misleading. Jae Lee's style is very dark and very modern. It's full of shadows and whatnot, and it would have fit in very well in the Alan Moore era of Marvelman/Miracleman. When Neil Gaiman took over the title with issue #17, he crafted a story that had Young Marvelman take center stage. The finale of the story was never published, because they realized no one knew who had the rights to Marvelman. With Marvel acquiring Marvelman, one assumes the rights have been straightened out, and while most people are waiting for reprints of Moore's run, people are also waiting for Gaiman to finish his story. A darker take on the story featuring Young Marvelman would then lead some people to believe that the Jae Lee pin-up was a step in that direction. I don't know what the nature of the project is. 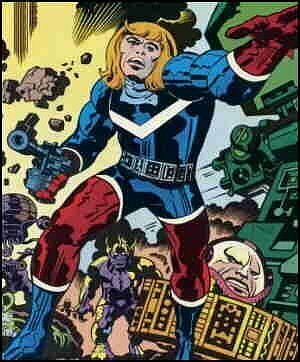 Maybe Dynamite is reprinting Kirby's independent stuff. Or maybe it's like Project Superpowers, where Alex Ross tries reviving Kirby's independent stuff with the help of other writers and artists. Unfortunately, I find Project Superpowers lacking - not only in terms of living up to their Golden Age roots; I also think they're sub-par comics when it comes to modern standards. The art relies too heavily on the coloring, and I find it hard to take it seriously. But you know, Kirby stuff isn't the Black Terror or the Golden Age Daredevil or the Green Hornet, so maybe this project will turn out better! And based on this review, I hope Silver Star will be involved too. So it’s another bunch of space gods with a circles on their outfits and piping that goes this way and that? 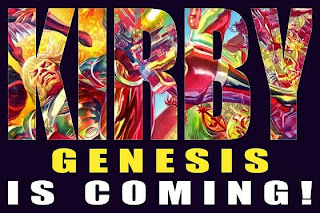 I like Kirby’s artwork and some of his older cocepts, however after a while his stuff is just retreads of his previous work. He’s got a million Captain (insert noun here)’s and several pantheons of space gods that, lets be honest, all look the same. Is there really that much difference between the Eternals and the New Gods, for instance? Wow, that's just sad, not to mention ignorant. I'll bet the poster never says anything like "So it's another bunch of superheroes in big cities who wear tights and they fight supervillains?"